If your report includes images and you distribute your reports via email, consider using one of the exports for Microsoft Word, such as the Word - HTML or Word - summary records options. You could also generate a PDF from either BizInt Smart Charts or from the HTML. Another option is to create a PDF from the HTML export by opening the HTML export in Adobe Acrobat and saving as a PDF. There is no capability to embed images in an Excel xls file, so images in Excel will always be links. A Links panel will appear showing all the links to the graphics. Select all the items in the list, check the "Save picture in document"
box at the bottom right of the panel, and click OK.
Save the file as a .docx file. file size: the Word file should be 2-3 times larger after you embed the images. In Microsoft Word 2013 and 2016, you can find the Edit Links panel by opening File | Info, and looking in the bottom right of the panel. In Microsoft Word 2007 and 2010, you can find this panel on the home menu under Prepare. 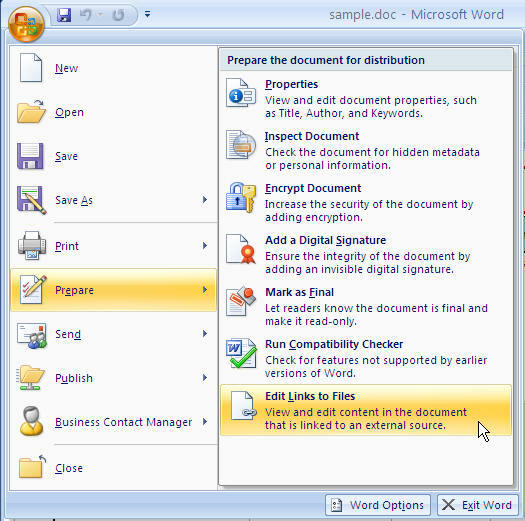 The option to Edit Links to Files will only appear if the Word document contains editable links. The picture below shows where this option is located. In earlier versions of Microsoft Word, the Edit Links panel is found on the Edit menu (Edit | Links...). From BizInt Smart Charts, export your report using the "HTML (chart and records" format. Acrobat will convert the HTML to Acrobat format. Save the file as a .pdf file.